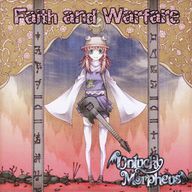 Faith and Warfare is a doujin album by Unlucky Morpheus released on 2011-12-30 (Comiket 81). It features instrumental arrangements of themes from Phantasmagoria of Dim.Dream, Lotus Land Story, Phantasmagoria of Flower View, Mountain of Faith, Undefined Fantastic Object, Fairy Wars, Magical Astronomy and Strange and Bright Nature Deity. This page was last edited on 11 October 2016, at 15:30.